Please adjust the speed of your comments appropriately. This scribble was published on Saturday, July 25th, 2009. You can follow any banter on this scribble with the RSS 2.0 feed. You can share your inspired musings after typing the anti spam word near the bottom of the page. But no Pinging because its too naughty. 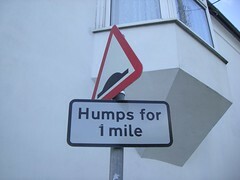 A mile of humps is one hell of a holiday romance. Unfortunately, many men I knew seemed capable of completing a mile in under 4 minutes. I live on the midwat point of a road with humps for 920 yards. It’s also the rat-run for ambulances. I can’t help worrying about the consequences.